Beware! This dish is not for the faint of heart or palate. 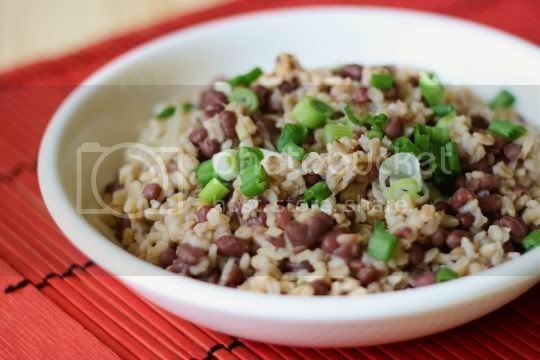 LOADED with ginger and salt, this unique twist on Japanese cuisine (beans and rice, really?) is probably best served with something mildly flavored, or even something sweet (orange-glazed tofu anyone?). Otherwise, be prepared to blow your taste buds out of the atmosphere. Two whole tablespoons of minced fresh ginger are included in this recipe (if you're not a huge ginger fan but still want to try this, you can probably reduce the amount by half). That may not seem like a lot, but the way it's cooked doesn't really allow for any of the pungent spiciness to fade. It's quickly sauteed for not even a full 5 minutes, so you're essentially eating it raw. The ginger is sauteed in sesame oil with the adzukis, mirin, umeboshi vinegar, and salt. While mirin is sweet (and barely shows up in the finished dish), the umeboshi (pickled plum) vinegar is surprisingly salty. This was my first time trying it, and I was totally expecting a fruity tanginess, not salt. And then more salt added on top of that? Sheesh! In fact, I'd suggest reducing the salt here, or completely omitting it from the cooked rice and barley combination. If you don't have or can't find the vinegar, soy sauce would probably be a decent substitute. 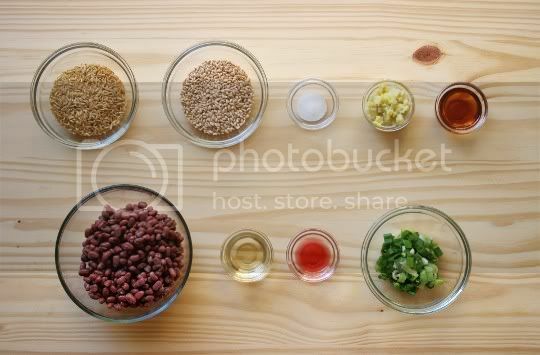 Once the ginger-bean mixture is heated through, add it to the cooked rice and barley, stirring well to combine. Sliced green onions as garnish add to the pungence of the ginger, but also give the dish a nice vegetable crunch. 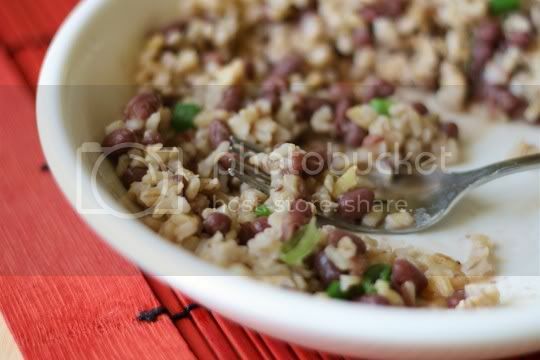 The rice and barley are perfectly cooked--chewy, yet still slightly firm with a bite--giving the dish a great heartiness with the beans, which add some creaminess and richness as well. Make again? Probably not. While the dish did have good flavor and uniqueness, the overloaded salt and ginger amounts were a bit much to REALLY be able to enjoy it. I just came across your blog on foodgawker and it is beautiful. I look forward to following your posts. This recipe actually looks really interesting. I think I might attempt it with less salt and ginger.